Welcome to another addition of the Casual Deck Strategy articles, and this time, we will be visiting an Archtype comprised entirely of Spell Cards! While the “Bamboo Sword” archtype definitely did not have a strong origin with a grand ‘useless equip’ in Tactical Evolution many moons ago, the archtype is definitely coming into its own as an effective theme-enhancing, combo strategy with the release of the latest support card in NECH, Fiendish Bamboo Sword. Let’s jump right into this unique strategy! The equipped monster gains 0 ATK. You can target 1 other “Bamboo Sword” card you control; return that target to the hand, and if you do, the equipped monster can attack directly during this turn. You can only use this effect of “Fiendish Bamboo Sword” once per turn. If this card is sent to the Graveyard: You can add 1 “Bamboo Sword” card from your Deck to your hand, except “Fiendish Bamboo Sword”. So I mentioned in the opening that the Bamboo Sword archtype can actually contribute to a combo-based strategy, but I don’t quite think you are imagining the potential. To give you a glimpse at the cool interactions, Golden + Fiendish in hand is a +1, then when your Fiendish hits the Graveyard, you get another card to replace it. Awesome, that’s a +1 that sets you up for an additional +1 later. Or perhaps Fiendish + Soul Devouring, which is an immediate -2 in hand presence, but with a successful direct attack, Soul Devouring prevents your opponents draw phase (+1 in hand presence compared to opponent) and then Fiendish will replace itself when it is sent to the Graveyard (+1). And that’s if they put an end to your monster before it can strike directly on the next turn. Replace Fiendish with Broken Bamboo in any of the situations for similar results, just you don’t get that extra Bamboo Sword whenever it is sent to the Graveyard. Let me guess your next question. You are even wondering the place of Broken Bamboo sword in such an archtype, when there is a bigger and better option in the form of Fiendish… Well to be frank, there is only 1 reason you should ever continue to use Broken Bamboo: Fiendish searches it when you need an Equip Spell Bamboo Sword to enable your other 2 Bamboo Sword cards. And yes, Fiendish’s search ability really is that easy to trigger if you think about it… That’s right, I’m thinking about our favorite Rank 4 for sending stuff to the Graveyard: Lavalval Chain! But 4 Spell Cards do not make a Deck…. Hence why the archtype is currently seen as dysfunctional or useless, even after the release of Fiendish Bamboo Sword. And to an extent, those that share the opinion are 100% correct, the Bamboo Swords cannot make a deck on their own. That simply isn’t their function. Take a broader look at the archtype. None of them require anything more special than any old monster that can get an Equip Spell attached. In tandem with the others, the archtype can add draws, lockdown potential, and deck thinning in exchange for a couple of slots in the Main deck. So let me refocus on the main purpose of this archtype: It enhances the range of ability and function of the other cards you include with them. Chew on that for a bit. I think its quite ingenious, making an archtype based around Equip Spells that give the equipped monster 0 bonus ATK support the equipped monster in other ways. I can liken this archtype to that of the Atlantean archtype, as they were designed to enhance the function of the Mermail beyond their normal, in-theme capability. The Bamboo Sword archtype simply takes that function and applies it to any deck it can be ‘splash’ed into. Now this is not saying that the Bamboo Swords can get thrown in anything and everything for success, there are definitely some decks that benefit more from such an engine. Another similar comparison could be drawn between the Bamboo Swords and Pendulums. 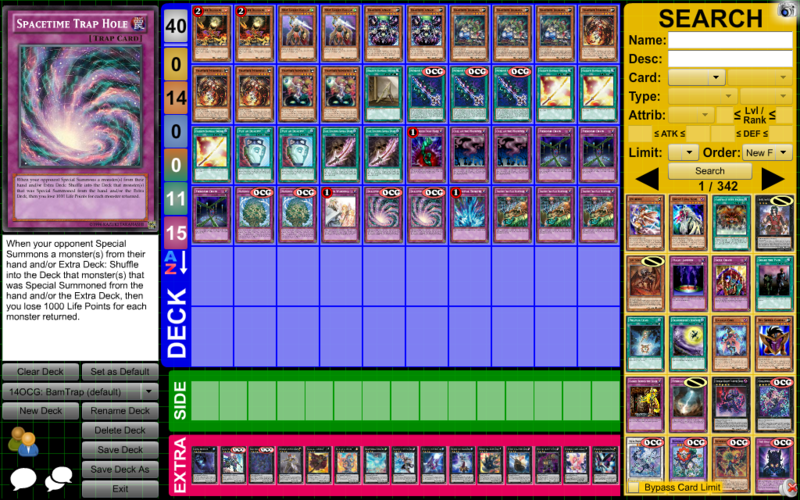 While Pendulum summoning is a mechanic that works amazingly for some decks, it’s not perfect for all decks. You just need to dedicate a couple of cards in your main deck to open that additional power. I come to devour your soul…. Contains monsters that replace themselves in advantage. 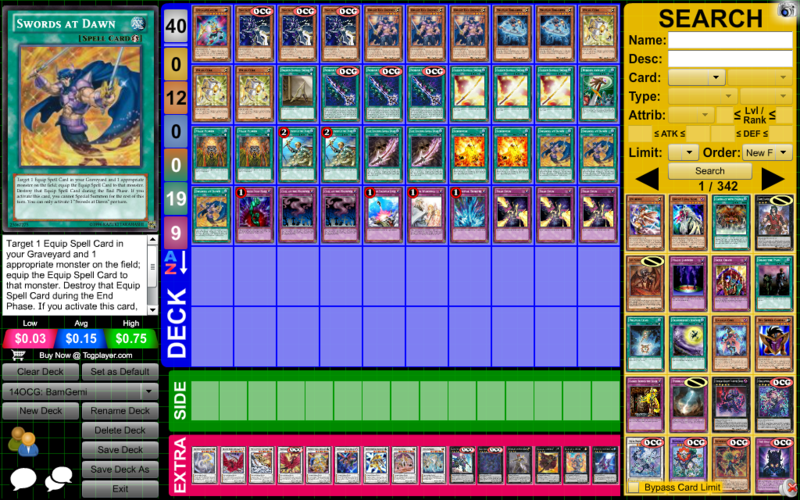 Decks that can excel with 30 cards or less in the Main Deck devoted to their strategy. If you can’t fit it in without losing consistency or effectiveness, adding Bamboo Swords is not worth it. While all 3 of the above are preferable, certain decks can excel at one of them to the point that it validates such a strategy. This is just general guidelines in order for you to have in your mind when considering what to pair with our Bamboo Swords. *The typical balance is 1 Broken and 2 Soul Devouring, but if you are running monsters that may attack directly, maximizing the draw phase lock may be preferable. As I stated before, you should always run at least 1 Broken so that you have an Equip Spell Bamboo Sword to search with Fiendish if you get in a pinch. This core lineup ensures that you have the best possible chances to get your Bamboo Draw engine and/or Bamboo Draw Lock in motion! While it is definitely true that you are not going to open a Bamboo combo every duel, the longer a duel goes on, the better your chances get for seeing combos! Hey look, the broken sword turned gold! Fire Fists get even deadlier when you add a Draw Phase lock to their toolbox of options. In addition, Fire Fists already have an insane amount of deck thinning; benefiting your chances to draw into Bamboo combos. Don’t forget, Fire Fists also have many plays to fall back upon if your Bamboo engine isn’t rocking your world. 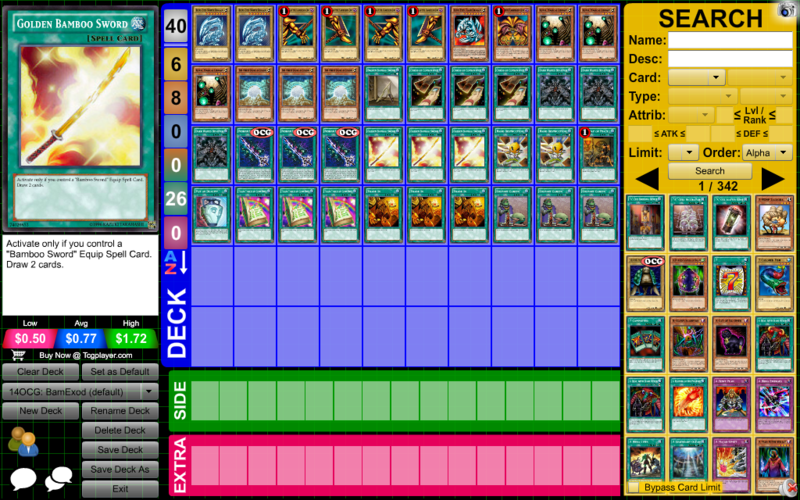 This was sorta my test pilot variant for the Bamboo Sword archtype, so I am sure there are a ton of problems with it, just its a cool place to start. With a focus on Equip Spells, you can really do amazing things with the Bamboo Swords. With Knight Day Grepher recycling Fiendish and Vylon Cube searching Fiendish, you are set for life once you draw any number of combos. This Bamboo variant is quite unique in that it removes the requirement of having Fiendish with Soul Devouring to guarantee direct attacks for the draw lock. 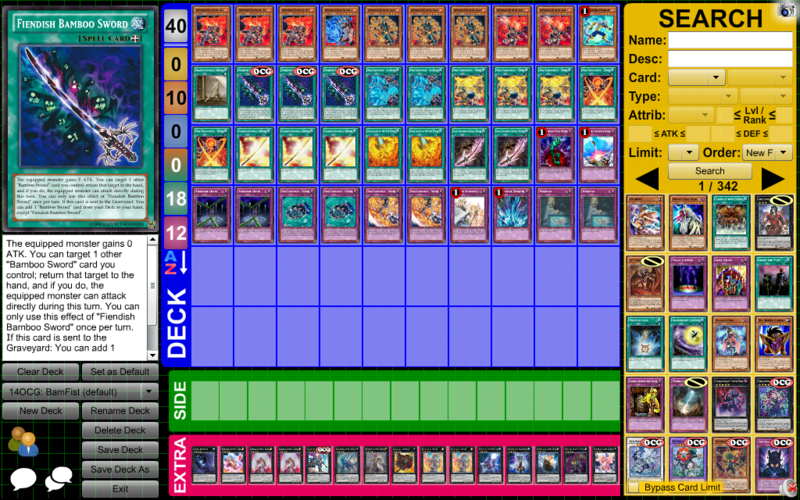 While you will eventually need a Fiendish to loop Soul Devouring before it destroys itself, you can definitely fall back upon the power of a Watt-Hunder deck to win the duel with or without bamboo combos. The only issue with this specific variant is that you lose out on a ton of cool techs most hunder decks can consider running! While this Bamboo variant isn’t all that revolutionary, it definitely puts Golden Bamboo Sword to work. The free 2 draws offered by Golden and the free deck thinning by Fiendish is almost too good to pass up, especially with Royal Magical Library. While “A Hope For Exodia” is the more popular build at the moment, certain RML Exodia builds turned to a Broken Bamboo with a couple of Golden before the reveal of Fiendish! Now that Fiendish also benefits from being discarded by Hand Destruction or Dark World Dealings…. yeah, you get the picture! 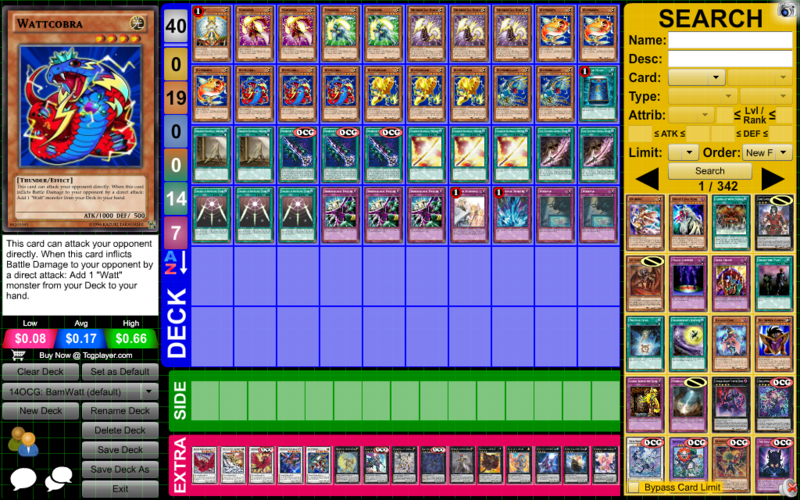 Falcon Control, -tellarknight, ALICE, Goblin, Star Seraph, Battlin’ Boxer, Spirits, Worm, Ice Barrier, Lavals, -lswarm, HERO, Crystal Beast… AND many more that I didn’t list! Summoner Monk – Any deck that employs this Semi-Limited card can have a lot of fun with Fiendish, simply because the Monk’s effect becomes a +1 if you discard Fiendish. In addition, you also are running an expanded spell lineup with the Bamboo Swords to make him live even more! Vylon Cube – Using a variant that loves synchro summoning? If you use the Cube, remember that you can always add a free Fiendish when Synchro Summoning for a LIGHT monster! And if you already have a Fiendish in hand, activate it before synchro summoning, so you get a Golden off of Fiendish’s effect and a new Fiendish off of Cube! Vylon Vanguard – Yes, I realize I’m listing some Vylons here, but it makes sense as they kinda are the ‘Equip Spell’ archtype. Anyways, Vanguard is being mentioned here because he is one of the few monsters that actually give you something for having a Bamboo Sword equipped to it. Most monsters really just don’t care about a 0 ATK gain. Seven Swords Warrior – Who’s that forgotten Synchro Monster. While it is true that he is normally useless compared to just about any other Level 7 Synchro, he does have a place by offering slight effect damage when you equip a Bamboo and monster removal by using one of your equipped Bamboo Swords. And yes, that monster removal can also trigger Fiendish, which is AWESOME. Swords at Dawn – This Quickplay spell may be forgotten as well, but don’t underestimate the power of a Bamboo Sword from the Graveyard if you really need to start a Bamboo combo! Also, if you bring back Fiendish, you get a Bamboo Sword at the End Phase as well! Don Zaloog | X-Saber Airbellum | Wattberyx | White Magical Hat | Wattchimera– Never underestimate the power of robbing a random card from your opponents hand, especially if you are combining that with the power of a Soul Devouring and Fiendish Bamboo combo! Taking away 2 cards from your opponent’s list of options can be amazing in giving you an edge up in a heated duel! Number 82: Heartlandraco – We had a Synchro monster on this list, so why not an Xyz monster. The Bamboo Swords are cool that they are Spell cards, therefore 3 out of the 4 of them prevent your opponent from attacking our lovely Rank 4 friend. Also, it has a built in direct attack, so it can trigger Soul Devouring without requiring an empty field or Fiendish… Quite a lovely monster with the Bamboo Swords! Hidden Armory – While this card cannot search all of the Bamboo Swords, it can search the essential Equip Spell Bamboo needed for any of the combos. Just note, you cannot Normal Summon the turn you use it, so either run monsters that have an inherent Special Summon or you can always resort to equipping your Bamboo Sword to an opponent’s monster. That is, if you really want to get the draws off of Golden! Thank you so much for arming yourselves with the knowledge to wield the awe-inspiring might of the Bamboo Sword archtype! I hope you enjoyed the article, but feel free to leave comments below for me!